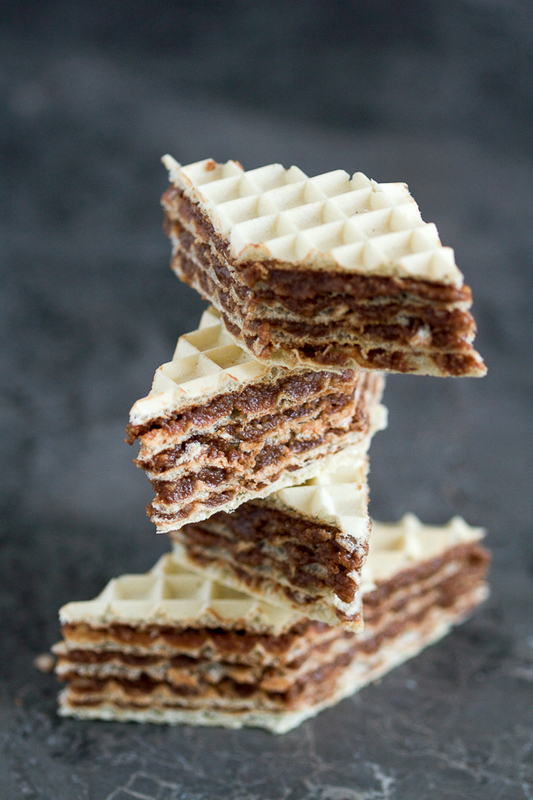 Balkan No Bake Wafer Cake: layered tort wafers connected with a smooth filling made out of chocolate, butter and walnut melted in hot milk. 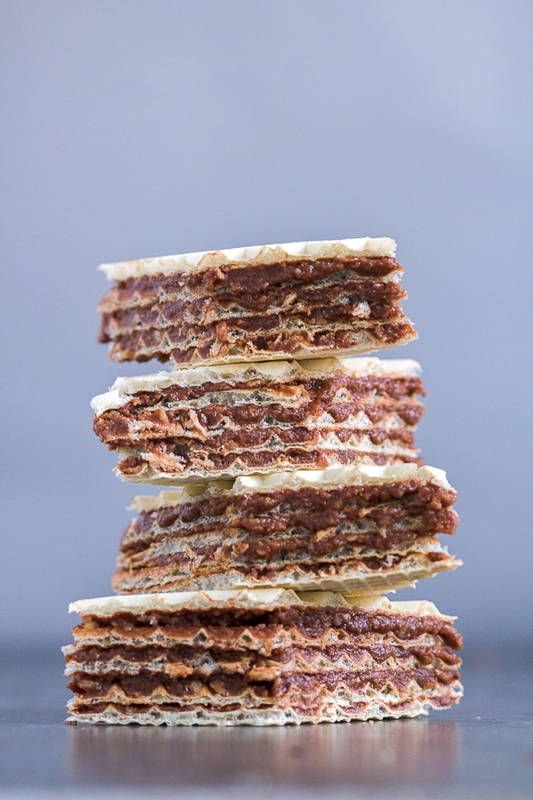 Imagine chocolate wafer cookies. Imagine them bigger. Now imagine a cake. That’s what we’re making this morning! Preparation process is super easy. This is one of those recipes perfect to make with kids (or nieces and nephews). You don’t have to wait for the holidays to make this no mess cake either. Just make it your simple Sunday dessert. 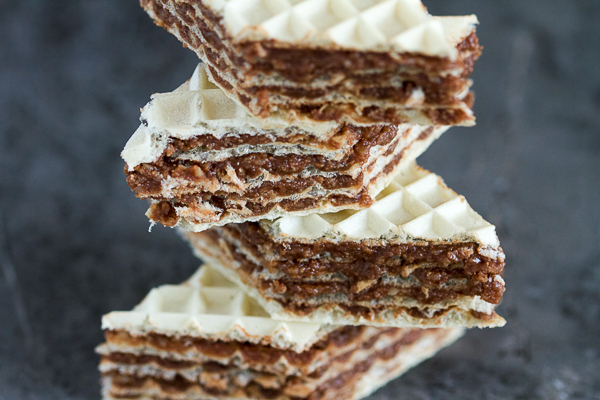 Ingredients for the filling (butter, dark chocolate, walnuts) are available everywhere. The trick is to find the actual tort wafers. I had a hard time locating them in grocery stores in the US. Your best bet is to look for them in Russian stores. Or Euro-import kind of shops you see a lot in strip malls. Get a few packages! They’re inexpensive. 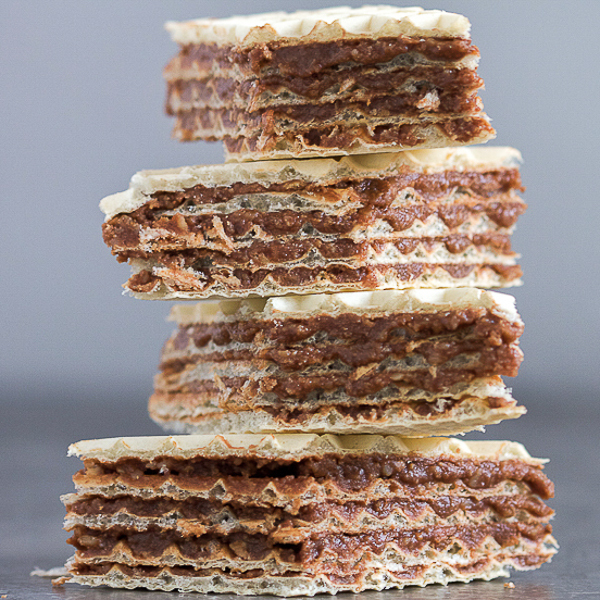 And you’ll probably want to make this wafer cake all the time. Usually, about 5 wafer sheets come in a package of 200g (7oz). However many there are, make sure you divide your filling evenly. 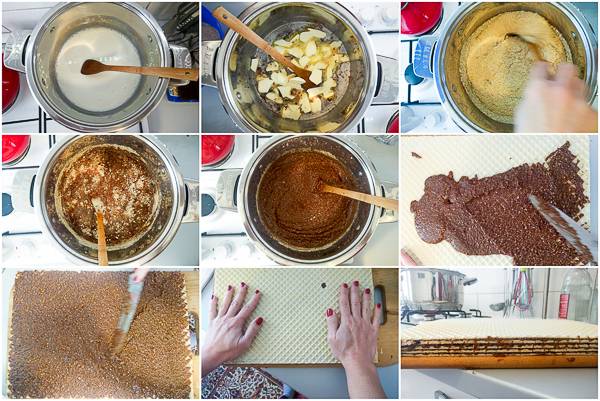 You’ll fill each layer in between the bottom and top one, skipping the actual top of the cake. You’ll notice from the photos that wafers come in long rectangular sheets. (Sometimes they are round too.) Mine came in 16×13 inch rectangles. These are thicker than cookie wafers, and hard to cut without crumbling. This is why we wait overnight before cutting. To allow the filling – and thus the cake – to firm up. This time around I made the mistake of only waiting a few hours before I cut the cake up. Nothing bad will happen if you do this. But if you take a closer look at the photos, you’ll notice the filling is a little messy on the sides. It hadn’t hardened enough yet. The waiting period also allows the cake to toughen up a bit. So when you bite into it, it’s a nice, slow descent into sweetness. Another thing. Note the biscuits used in the filling. I used French Petit Beurre biscuits, generally easy to find in the cookie aisle. You should be able to find them in your grocery store easily. Otherwise, check Walmart. Sometimes they’re called LU LE European Biscuits, Petit Beurre. You can use other but similar biscuits. The only word of caution is to think European, hard, cookies kind of biscuits, and not the soft, warm American breakfast biscuits. One of my nephews loves oblatne. At one point he ate so many he didn’t want to eat them again for a couple of years. Lately, he’s been on a binge again though. This may happen to you too. You may love this so much you get sick of it. To get sick of this cake you have to make the cake first though. 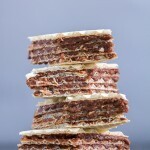 So start looking for Euro stores, listen to some bad disco, and make the wafer cake happen! Place milk and sugar into a deeper pot and bring to boil over medium, stirring frequently. Remove from heat. Meanwhile grind biscuits, and walnuts, separately. Cut up butter, and chocolate and add to the pot. Stir well. The next to add are the ground biscuit, stir, and when the mix is consistent, add walnuts and stir again. Finally, add the vanilla extract. Stir everything extremely well until you get a consistent, thick filling. Divide the filling into 4. Take the Tort wafer sheets out. Place the bottom layer on a pan, or a large cutting board. Take 1 portion of the filling, and spread it evenly over the entire sheet with a knife. (Start by pouring the filling in the middle, and then move it out to the sides with the knife until its consistent everywhere.) Place the next sheet on top of the filling, making sure the sides are aligned. Cover with foil or plastic wrap, and then place something heavier over the entire top of the cake. This object can be another pan or a cutting board. It should be heavy enough to firm it up, but not too heavy as to squash it. Leave to firm up at least 6 hours, preferably overnight. Can i substitute chocolate for caramel? To make grilijas oblatne? I haven’t made them with caramel and I don’t like giving advice on recipes I haven’t done myself. I don’t want to steer you in the wrong direction. Ari sure you can, in fact I used to make it years ago while I lived in Romania. First the sugar must be caramelized, make sure doesn’t burn, then add the milk and bring it to boil. I never used chocolate for this recipe but the cake was delicious, chocolate overtake the heavenly test of caramel and walnuts.